All About Chiron in Astrology. Detailed interpretations of Chiron, the wounded healer. Chiron is a comet with a unique and erratic orbit. It is called the Wounded Healer, the Teacher of Higher Knowledge, and the Rainbow Bridge between the material and spiritual realms. Chiron was named after the centaur in Greek mythology who was a healer and teacher who, ironically, could not heal himself. 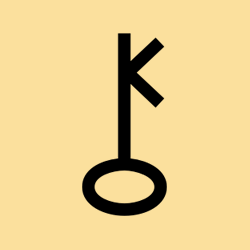 Its glyph is a key, and its influence is also that of a key to many methods whereby a small action can bring about a powerful effect (as a small key opens a large door). Chiron is associated with the emotional wounds we receive early on in our lives. The sign Chiron is in will dominate but the house placing will show in which area the personality is motivated and into which they will put their efforts. It rules astrology, use of crystals in healing, and holistic healing arts of all types. It also rules use of the hands in healing, therefore massage, polarity therapy, or energy healing with the hands. It is associated with computers and electronics, especially any methods that manipulate or compress time. It is the link between Saturnian time, which is linear and limited, and Uranian time, which is 'soul time', or in the aboriginal traditions 'dreamtime', which is not limited by Saturn's measuring of time. It rules initiation and initiatory process. The roles it plays are those of healer, teacher, maverick, visitor, and keeper of keys. It is associated with the hands. As we open to Chiron, he brings us a multi-dimensional perception, coming either in the form of an outer teacher [Saturn] or as a soul-knowing, or spiritual guidance [Uranus]. Wherever Chiron appears in your chart is where you are called upon to heal yourself and give your gift, and so it is associated with a deep sense of purpose. It is where you find a key [or keys] which can be shared with others, but only after you have used it for self-healing. Its lesson and work are always holistic and expansive. The Sabian symbol of its degree is said to reveal your soul's wound. Its transits, especially the squares, conjunction, and perhaps the opposition, often bring about a crisis that is a key to awakening, or self-remembrance. There may be confusing experiences that cause you to question your assumptions about time and reality. This is the Uranus influence, undermining the limitations of Saturn.